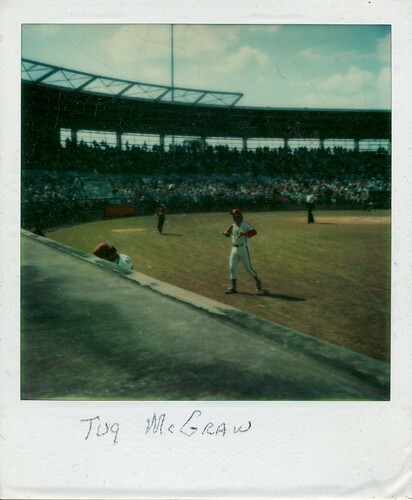 These are Polaroids my grandparents took in Clearwater. I’ve had these for a little while, they likely were discovered when cleaning out the trailer. I think they are from 1979 based on some detective work. The first overlap was Pete Rose (I assumed his son would only be there when he was on the team) and Greg Luzinski. That narrowed it down to 79 to 81. The most obscure name was Hebner which I figure to be Richie Hebner, who played for the Phillies in 77 and 78, however he was traded to the Mets late in March of 79. So I’m going with 1979. 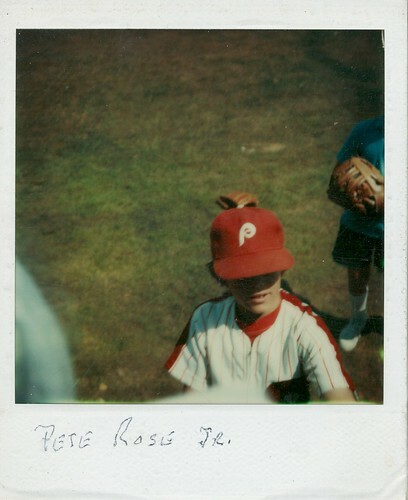 Pete Rose Jr. I think I saw him play in the minors. Tony Taylor. He thew me off for a minute because his last year was 1976. 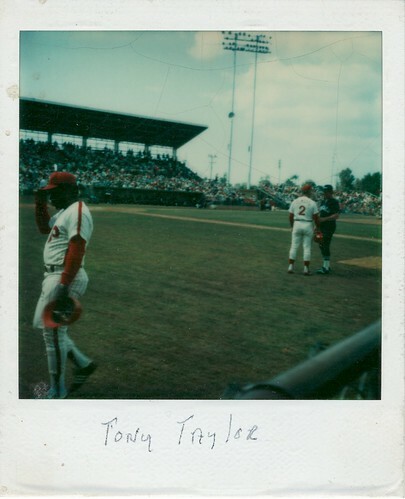 Then I figured he must have become a coach, which is correct, he was the First Base Coach from 77 to 79. 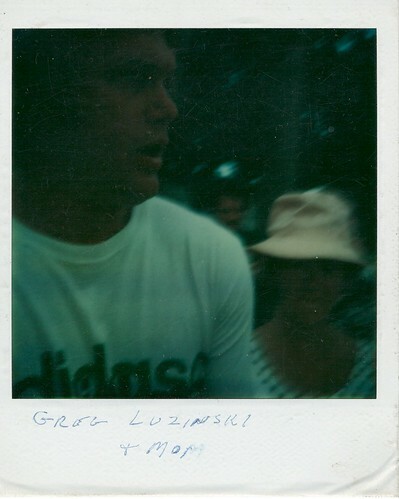 Greg Luzinski and my grandmom. Very curious about this one. Did they track him down in the parking lot? How did they capture this since he is walking by but my grandparents were prepared to take the picture? Sometimes I think even older people pretend they don’t know what Twitter and Facebook are all about. I never put Charlie Manual in that category. Even with a bunch of his players tweeting all the time. I stopped following all of them, it was too much. That means nothing about this video is surprising. Yet it is still so amazing. I have a thing for smart baseball plays. That’s right, he’s sooo coy. He’s also winless through 8 starts, 6 of them quality starts. Finally, tonight the Phillies scored 10 for him. Well, not for him. When Cliff left, it was tied at 3. The Phillies then scored 7 over the next two innings. It’s a win. Still in last place, but a win. 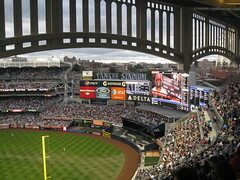 As I was taking some pictures in the 7th inning tonight, I took this slightly sideways one. As I was waiting to get the pitch, I thought Fontenot was awfully far down the line. It was a suicide squeeze! This play put the Phillies up 3-0, more than enough for Cole Hamels, who was killing it, it wasn’t until the 6th until the Nats got a hit. I wasn’t aware of the pitch count at the game. Seeing the 114, I guess I’m ok with the Papelbon move. This was my first Phillies game at CBP since the Home Opener in 2010. Last year I missed out due to school and being in California. 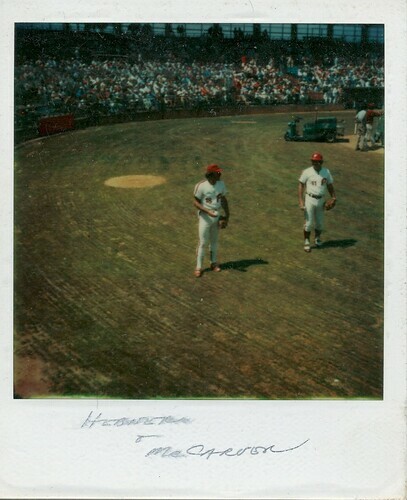 I did manage to see the Phillies when they came west to play the Giants. Last thing, Tuesday was Dollar Dog night. I think that helped the dog quality as the Dollar Dogs cleared out the stock. Although I’ve been to a few Dollar Dog nights and have strong feelings that they are not at all the same as the usual hot dogs. Amazing job by the Phillies. I haven’t been to an On Deck game in a while. I remember it was at the Vet against the Orioles. There was none of this. Favorite Story of the Day. I probably don’t need to tell you but the Phillie Phanatic was born in the Galapagos Islands. I didn’t see much about the details of the trip, but based on the pictures this appears to be a book tour as he is trying to sell his book about his adventures in the Galapagos Islands . What that little sea lion must be thinking. Check out all the pictures. A few weeks ago Evan called to let me know he had purchased a plane ticket to NYC. School would be over, so he was free. He didn’t have any plans for when he arrived. He checked the baseball schedule after booking the ticket and saw that the Phillies were in town on Thursday and the Mets would be there for the weekend. Phillies? I’m in. I checked with Janos, he was in too. Evan’s sister’s boyfriend John rounded out the group. I went on to StubHub and got 4 tickets in the very top row of the stadium, in a section where I thought we’d get a good view of everything. I think that goal was accomplished. There were Phillies fans everywhere. By the end of the game, they were all that was left. 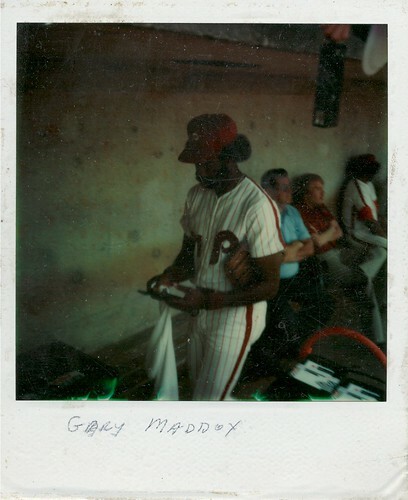 The 9th inning took forever and the Phillies put a few more runs on the board, leaving to a slow exodus of the rest of the stadium. 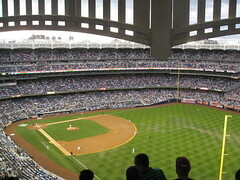 I’d been to the old Yankee Stadium twice. Once when I was about 11 and during the last season because Evan hadn’t been there so we made the trip. The new one certainly doesn’t have the charm of the old one. I feel like they tried to copy how the stadium looked at the end. Meaning they attempted to make the new building look old instead of letting it age. It either will look great in many years or will fall apart very quickly. To me, the biggest improvement is the amount of extra space. The lines for food used to fill the concourses so you couldn’t even walk through. Now there is almost too much space, which is a good thing. 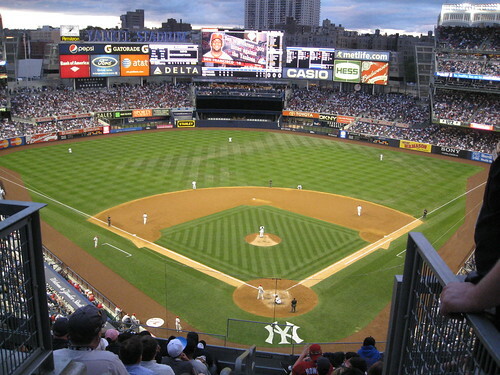 Any points gained by design improvements are lost by that ridiculous restaurant in center field. 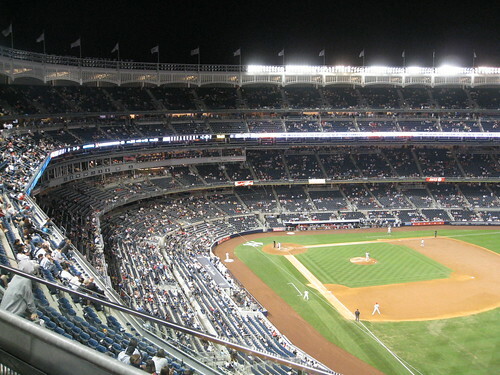 There is no excuse for the bleacher seats being blocked from seeing the other outfield. TV screens are not enough. The video screen in center field looks amazing. I’m just not sure why they don’t use it for replays. I saw a few early on, but later in the game, there was nothing. Especially in the 9th when the Yankees left the field and no one could figure out what had happened. When I got home I saw that Ibanez had been hit by the grounder to end the inning. No replay or anything in the stadium to let us know what happened. 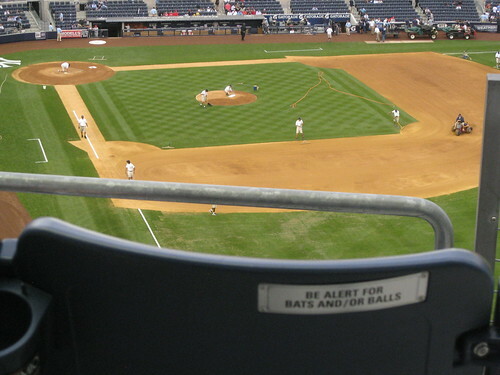 On last thing, every seat in the stadium has a warning: “Be alert for bats and/or balls.” Every seat. Even all the way in the upper deck. This picture isn’t even from all the way at the top where we were sitting, yet still, really, really far. No bat was making it’s way up there. Today’s Phillies game was nuts, but this one play was just amazing. First, mlb.com called this clip ‘Howard’s strong throw home’. Umm, did you watch the clip? Schneider turned into an acrobat to make up for the poor throw by Howard. Howard decides to go home instead of getting the 2nd out at 1st. The infield was in, but he still could have gone with the easy out, letting the Giants tie the game. He made the throw and it made it to the catcher. Schneider catches the off-line throw. Spins around to get his glove to the plate. He not only gets it there, he gets it in front of the plate. This blocks the front of the plate and he’s in position to sweep the plate. He does this and Uribe plants his hand right on the glove. The bat was even in play, if Uribe had decided to go a different route. Schierholtz, who was on 2nd after a double, doesn’t advance on the play. I don’t know what game he was watching. At worst, he froze on the hit. Once Howard goes home, he should have broken for 3rd. Even if the throw is on line, it’s very unlikely that he’s getting thrown out at 3rd. 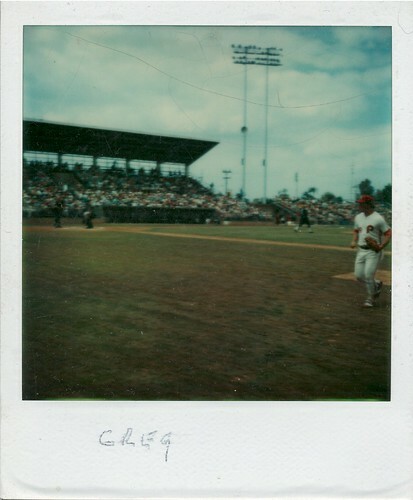 The Giants were left still a run behind with an out left, but the tying run was on 2nd, not 3rd. The Phillies got that last out and won the game. I still would have been just excited about this play had it all fallen apart, again. Letâ€™s take a minute to remember Kim Batiste. In Game 1 of the 1993 NLCS the Phillies were leading the Braves 3-2 going into the 9th. In came Mitch Williams to pitch and Kim Batiste replaced Dave Hollins for defensive purposes. What happened? Batiste made an error on a Mark Lemke ground ball, so much for the defensive replacement. Two batters later Otis Nixon, on what should have been the third out, knocked in the tying run on a ground ball. All was not lost for Batiste. With the game still tied in the bottom of the 10th John Kruk doubled with one out and that brought Batiste to the plate. He hit one down the 3rd base line. There was no way fleet footed Terry Pendleton was going to stop that one. 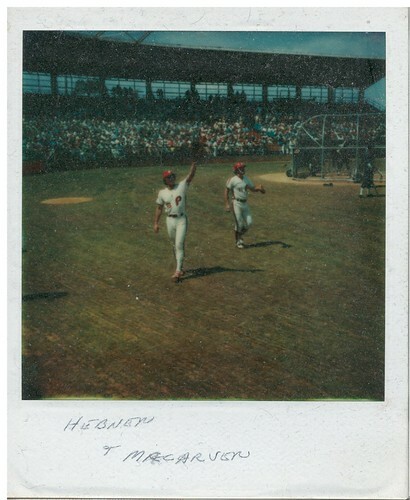 Kruck scored and the Phillies won Game 1. I couldnâ€™t find video of that game, but here is the box score and play-by-play. I took some of the finer details from that play-by-play, but I actually remembered most of it. That game was 15 years ago. I remember watching in my room, which is odd cause I didnâ€™t have a TV in my room. I think because the games were going to be on late my parents put a TV in my room thinking that at least I would be â€˜in bedâ€™ even if I wasnâ€™t getting to sleep until late. There is a good lesson there, always let your kids stay up for those moments. They may not come again for quite a while. I donâ€™t remember too much about the rest of that series. I remember when we clinched in Game 6, because I was there, only a few rows behind the Braves dugout. I really wish I had a camera back then. I canâ€™t remember if I took a camera, even if I did, I was very short and probably wouldnâ€™t have gotten very good shots. Now the Phillies are back there. I canâ€™t tell you how excited I am. I was tense the whole game when we clinched the division. 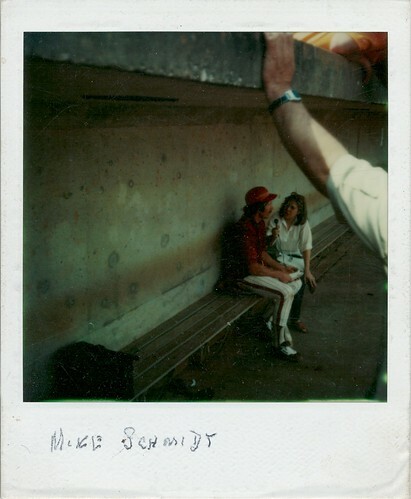 I couldnâ€™t sit still during the games against the Brewers, especially in the later innings. This is a family problem, my mom canâ€™t even watch the games, she paces around too much. When we won that series on Sunday I did a little screaming and jumping up and down. I was very sick this weekend so my celebrating was limited. Iâ€™m not making a prediction, I donâ€™t have any clue what is going to happen. We could sweep or get swept. Or it could be a very painful 7 games. Iâ€™m going to watch every pitch and realize that it could be another 15 years before I see any of this again. I’m trying to keep an open mind when it comes to the Johan Santana trade. -The Mets had to give up 4 of their Top 10 prospects. This will hurt them down the road. Although I’d be much happier if they threw in Fernando Martinez as well. -They are going to pay him a ton. Although being in New York and having a new stadium next year, this isn’t an issue. -Santana only went 15-13 last year. I guess you could argue that the Twins weren’t as good as last year. Of course I’d want Santana on my team. Problem is, my team is the Phillies. We would never get him. We don’t have the talent in the system to make a trade like that. If we gave him a contract like that we wouldn’t sign anyone else. Then how would we sign guys like Adam Eaton and Pedro Feliz? Alright, I’m a little scared. Are you ready for the Santana/Hamels rivalry?